Amy graduated from the Royal Welsh College of Music and Drama with a 1st Class Hons Degree in Music and a Post-Graduate Diploma in Opera Performance. During her time at the college Amy was awarded the Betty Richards Prize, the Dolan Evans Prize, a Leverhulme Scholarship and the Jenkin-Phillips Prize. Amy has performed in many Operas and her roles include The Queen of Night (cover) The Magic Flute (RWCMD) Mini Die Fledermaus (Opéra de Baugé) Le Feu L’Enfant et les Sortileges (Bute Park Opera) Peep-Bo The Mikado, Mabel The Pirates of Penzance (Everyman Summer Festival) Jonny The Little Sweep (RWCMD) 1st Bridesmaid The Marriage of Figaro (Iford Festival Opera). 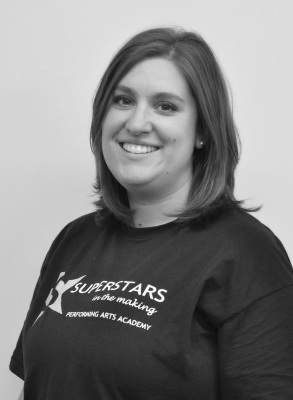 Amy began teaching at Superstars in the Making® in 2013 as the Assistant Musical Director for Grease The Musical. Since then, she has become the vocal coach for all the junior courses at SITM® and has been the musical director for The Little Mermaid Jr, which involved all of TwinkleStars, BuddingStars and RisingStars and more recently, Winnie the Pooh Kids. In 2014 Amy travelled to China as part of the original SITM® China team. She taught Chinese children the SITM® programme in a 10 day intensive course. In 2015 Amy helped run the SITM® South Wales Tour taster sessions, the result of which saw new academies open in Pontypool and Penarth, which Amy now leads. Outside SITM® Amy runs ‘sing-a-long’ workshops within care homes for the elderly and those who suffer with dementia. She also gives private singing lessons to a handful of students.